*Get this rate and free private transfer to the place instead of the standard free transfer! -Tart of tomatoes, golden onion and goat cheese Sirloin strip steak angus with, rustic potatoes with onions and fungi of pine. -Sorrentini of prawns and pink salmon on coulis of seafood. -Apple pie and cream of frozen vanilla / Dulce de leche cheesecake, chocolate caramel sauce. El Cafe de los Angelitos Tango Show was born in 1890, with other name, but because of the kind of gangsters that used to go, was renamed as the “little angels” by the Police Dept, and then by the owners. We can add to this story the frequent presence of great politicians and tango singers, like the best one, Carlos Gardel, who signed his first contract here. In 1940, this place was the first Cafe in been honoured with a Tango. 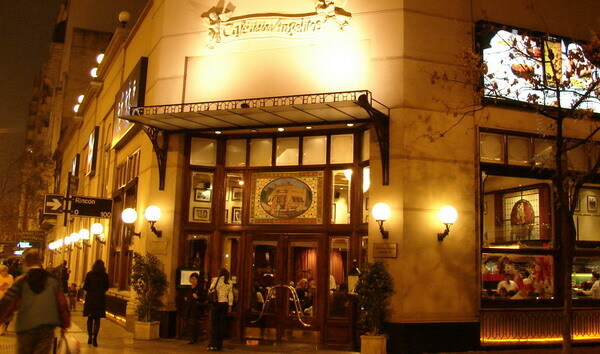 Closed by many decades, rescued by popular claim, Cafe de los Angelitos is also a Café and Restauran open day and night, with the theather for Tango dinner shows and an exquisite tangostore. The decoration at Cafe de los Angelitos with vitrals and its historic floor, deserves special atention. The theater is a space decorated like in Art Nouveau times. The food is specially suggested due to the menu is Gourmet. The core of this tango show is the high and explosive sensuality, one piece after other the dancers are doing a heat puzzle of passion. Dressed with the charm and purity of white, the stage gets coloured light baths that brings different feelings to it. In there you will see groupal dances of finely wrought. The wardrobe is probably the most exquisite in town, which also dresses the show as pure gala. Coreographies are cared and shows a perfect coordination not only in the couple dances but in the groupal plays. A fresh chic touch is given by the young world class talented members of the orchestra. 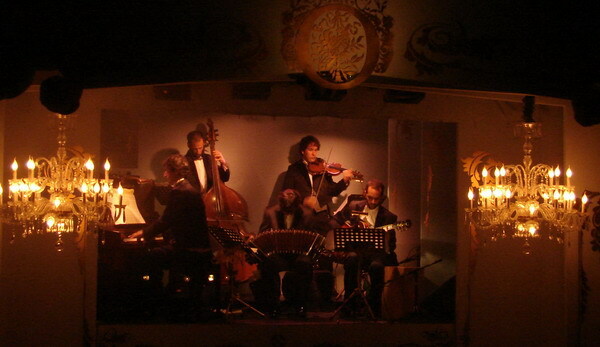 So well skilled musicians are able to explore not only the clasicism of those Tango that shined in Paris but also bring a modern and exclusive touch to the show. Voices are remarkable specially the lady who also dances, which is unusual. - Gravlax of salmon on toast of brioche and potatoes in emulsion of dill. - Green salad wrapped in blue cheese vinaigrette. - Tart of tomatoes, golden onion and cheese of goat. - Couscous's compression and vegetables roasted with balsamic reduction and oil of grasses. - Sirloin strip steak angus with green leaves, rustic potatoes with onions and fungi of pine. - Medallion of loin , burned tomatoes and gratin of potatoes with marrow. - Sweetened of lamb on ratatouille served in his juice. - Pavé of pink salmon on sauce of sorrel and bandondeón potatoes. - Sorrentini of prawns and pink salmon on coulis of seafood. - Apple pie and cream of frozen vanilla. - Dulce de leche cheesecake, chocolate caramel sauce. - Red fruits to the lemon grass and cream. SITE MAP (This is a really complete site, Enjoy it!